Well......after a rough few days I can say that I'm feeling better - much better. While things are still pretty weird and crappy at work, I've started to turn the corner and am focusing more on my break coming up in a week as well as what the 2016 year will bring. I spent some time scanning stuff tonight (trying to get caught up) and found this pack that has been sitting for a number of weeks now. It's been almost a year to the day since I posted about a really cool stamp set put out by Canada Post. Really nice looking "cards"....really, they're stamps but I'm never gonna use them. I think they are a nice collectible to have that will one day be pulled out of the closet and blogged about when I'm in my 60's. 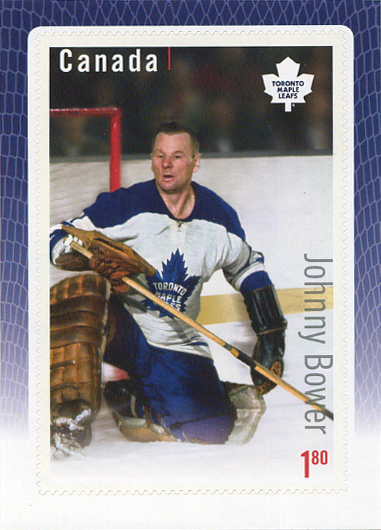 This year, Canada Post is back with a new set. This time....goalies. Yeah.....I'm all over this product. This wrapper reminds me of a real cheap junk wax era pack rip. Cool. It's basically the same concept as before. A six card pack, guaranteeing you a "complete set" with the shot of winning an exclusive autographed souvenir sheet in 1:40 packs. 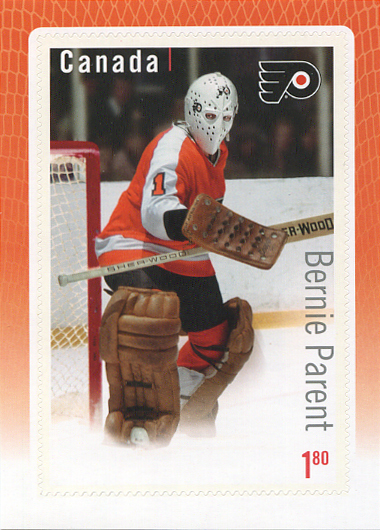 I have no intention in actually using the stamps....but you can (how cool would it be to receive a letter with a massive goalie as a stamp)? 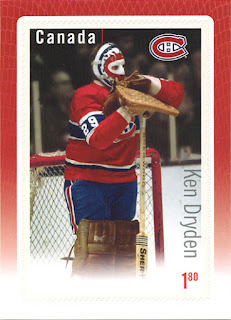 Classic Ken Dryden. A very good start. It's a simple design that compliments last year's set. Similar...but just different enough. Man is he ever tall (for a goalie playing in the 70's). His waist is almost at the crossbar. And that mask is just a beaut. Love it. Bernie!!! Nice to see a bit of an action shot (yeah....it's not spectacular, but it's better than a warmup/towel/skatearound pic). What a cool mask too. I should dig out my Time magazine that has his masked mug on the cover. Done. Watch for a future post on that. I like the orange border around the card as well. Matching is good. 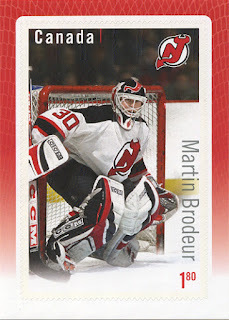 Marty Brodeur is the most current player in this 6-card set. 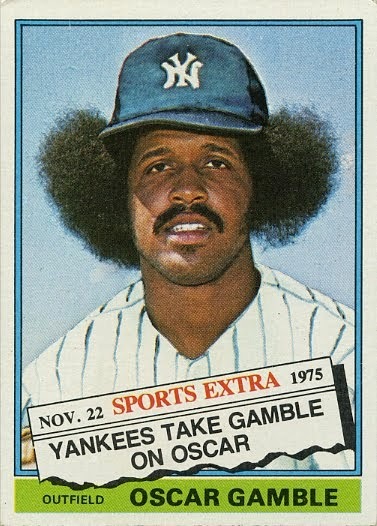 It's a nice card, but it just doesn't fit for me (wait until you see all six cards before you judge). Nothing really wrong with it....I just want a set that sits more in a certain era. The China Wall. What a great pic. Fresh face ready to be pelted and stitched, leather pads and a glove that goes up to his elbow. Absolutely no ads on the boards. 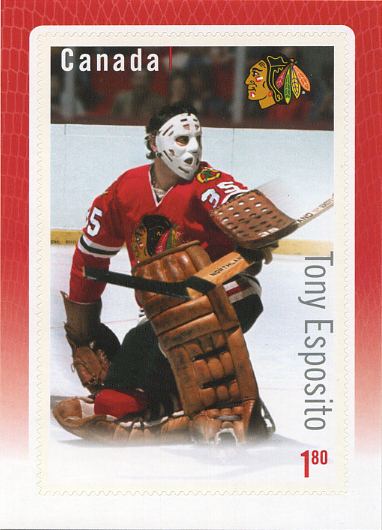 I like this Esposito as well, although I hope he saved the puck and isn't looking into the gaping net before the red goal light comes on. I much prefer my Espo pics without the wire protection on his mask that he implemented in the 80's. And, these guys wore little protection. Speaking of....does this guy even have padding on under that jersey?? 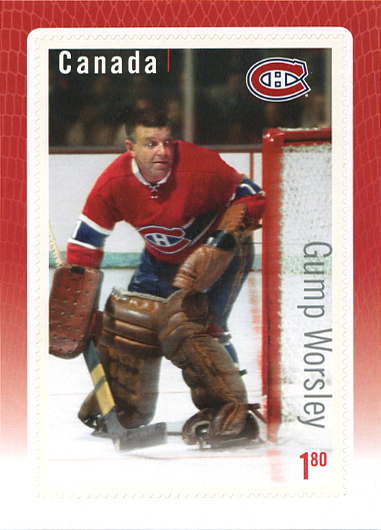 Great shot of Gump in his Habs uniform. Sans mask (he was a stubborn one....only played a few games with it at the end of his career). And he's so tiny (compared to Dryden). You want to increase goal scoring? Have the goalies wear this getup. Anyways, I obviously didn't win any sort of autographed versions but I really wasn't expecting it. I like that I've added this to my slowly growing Canada Post stamps collection. Looking forward to seeing what they come up with next year. A quick search on eBay shows a Parent auto and Bower auto. Haven't seen any of the other guys. 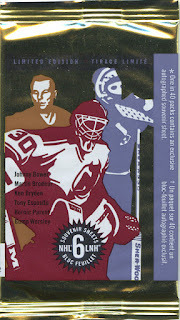 Would be shocked if there was a Dryden auto and of course there's no Worsley sig since he has passed away. 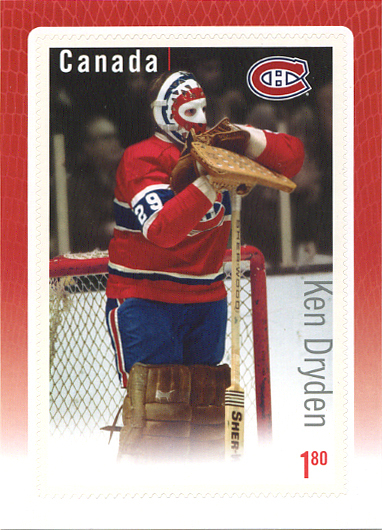 There is no Dryden auto. only 4 of the 6 are available auto'd... the aforementioned Dryden and Worsley are absent.